Making a good impression in a job interview is only the first step. For some, integrating into a new work environment can be the biggest challenge; a challenge made all the more daunting when it’s an international workplace. In an interview with SprachenNetz, Editor-in-chief of Business Spotlight Ian McMaster and Timothy Phillips, National Geographic Learning’s Germany & Austria Sales Executive, provide expert advice on how to make a positive first impression and navigate workplace complexities. “Making a confident start”: I try… Ian, Tim, both of you have been involved in the language training business for a while now. What is the trick to giving a lasting first impression in an international workplace? It is often said that you “only have one chance to make a first impression”, so it is important to think about how you present yourself to new colleagues — in order to ensure that the first impression you make is a positive one! And the first impression that we make is usually on a social level, rather than in relation to the details of our work. Of course, competence in the job is an important criterion for success at work, but good social skills are also a key competence. People like working with people whom they like. So your first task, both in a job interview and also when you start working, is to present yourself as an “attractive person” — by which we mean someone whom other people will want to work with. And, in general, we like people who are positive, helpful, open, considerate, sensitive — and interested in us. Outgoing people seem to have an advantage when networking with their international colleagues. What would you suggest to people who are shy? It is a bit of myth that extroverts necessarily have an easier time at work — or are better at making a good impression. Indeed, many extroverts make a negative impression on others, for example, by talking about themselves the whole time or being overly “noisy”, constantly having instant opinions and so on. So we shouldn’t make the mistake of thinking that being extrovert or outgoing is necessarily a good thing. In fact, one of the most important — and often underrated — competencies at work is the ability to listen well and show genuine interest in others, their situation and their problems. Shy or introverted people are often good listeners. Another key skill is the ability to ask questions, to find out what others think and how they “tick”. So, if you feel uncomfortable about talking about yourself, you can focus on your listening skills and your question-asking skills. Where do you see the main difference between a German and an English job interview? We probably shouldn’t focus too much on differences between German and English job interviews but rather be aware of the many different types of interviews that one can find in both of these cultures, depending on the people, organisation or industry. For example, some interviews (in both languages) can be very formal, others are less formal. Some are with a single person, others with a larger panel of people or in an assessment centre. One of the key skills that job applicants need is being able to assess the situation (and interviewers) quickly and to be able to adapt to their style and demands. This requires a high degree of sensitivity to different personalities and communication styles. We need to avoid slipping into cultural clichés such as “Germans are always formal” or “the English always love small talk”. As an applicant, you need to adapt to the people who are in front of you. Some people might think that this kind of flexibility is not being “authentic” (whatever that means exactly). In fact, it is just being smart. English = English? Are there aspects I need to consider when speaking to a native English speaker or non-native English speaker? The important principles are the same whoever we are speaking to. Your aim is to communicate clearly and effectively, so that the other person understands both what you are saying and why you are saying it. This involves using language that the other person is likely to understand — and could, for example, mean, not using lots of idiomatic language, not talking too quickly and so on. Particular care is needed when talking to non-native speakers. If you are a non-native speaker of English yourself, you certainly should not worry about the fact that you don’t speak English perfectly — remember that native-speakers often also don’t speak perfectly either. Your job is not to prove that you could be a professor of English — unless that really is the job that you are applying for. Instead it is to communicate clearly and in a way that makes interviewers want to work with you. In fact, mistakes can often be charming so the best advice is simply, “don’t worry, just speak”. What can Expolingua Berlin visitors expect when they attend your workshop? What will be the outcome? The aim of the workshop is to discuss and practice some of the skills necessary to be successful both at a job interview and also when you start a new job. This includes the ability to present yourself clearly to others, engage in small talk, listen carefully, etc. The workshop will be very practical with lots of audience participation; participants will take away some useful tips and will increase their confidence in interview and job situations. And, of course, we hope it will be an enjoyable and fun afternoon! We’re looking forward to seeing as many people there as possible. 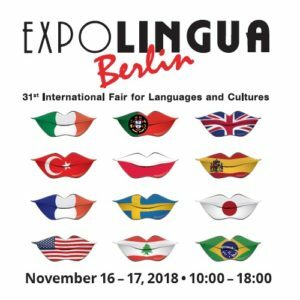 You can hear more from Ian McMaster and Timothy Phillips in their presentation titled: ‘English for getting started at work.’ The workshop will take place at Expolingua Berlin on Friday, November 20, 2015. Ian McMaster is editor-in-chief of the bi-monthly business communication magazine Business Spotlight and a former coordinator of IATEFL-BESIG. He is a regular speaker at conferences including Expolingua and studyworld. Timothy Phillips is Sales Executive, Germany & Austria, for English Language Teaching materials published by National Geographic Learning. He is also an experienced international communications trainer and has worked with a range of multinational companies based in Germany.